We are excited to announce that we are hosting an evening with High Intensity Training world wide expert Markus Reinhardt! Markus is recognised around the world as one of the top personal trainers and educators in body-building. High Intensity Training is a scientifically based strength training program. You too can learn the benefits of HIT with expert Markus Reinhardt. Markus has been a Natural Bodybuilding World Champion, is an international fitness model, and has become widely recognized as the star of the legendary HIT instructional video series with Mike Mentzer. 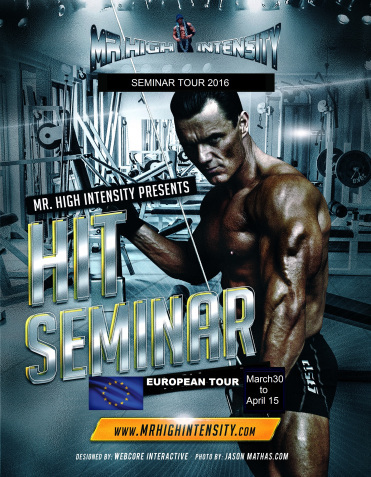 The purpose of his seminar is to teach you the benefits of high intensity training HIT and Heavy Duty HD. The main principles of High Intensity Training (HIT) are that exercises should be brief, infrequent, and intense. Exercises are performed with a high level of effort, or intensity, for brief or short bursts of time. It is thought that this stimulates the body to produce an increase in muscular strength and size. • You will be taken through correct form when using HIT. • Guided through advanced techniques e.g. pre exhausting and rest pause plus supersets. • The chance to volunteer from the audience to take part in the exercise with Markus Reinhardt. • Discussion and questions and answers session. We are also opening our new Strongman area in the gym for those wishing to progress their body building. We will have specialised equipment and personal trainers available to help you to develop further. If you can’t make the seminar but are interested to know more then please do give us a call or pop in. Don’t miss out on this incredible evening with world renowned High Intensity Training expert Markus Reinhardt. The evening will be packed full of valuable tips and demonstrations to really help you to undertake and learn more about this type of training. We will also be opening our strongman area so it will be a great opportunity to take a look around and ask us any questions. Venue: Physfit Gym, Barrow Road, Sileby, Leicestershire. Date: 12th April 6.30pmTicket prices are £20 to gym members and £25 to non-members. We advise you to purchase your ticket in advance as this is going to be a sellout event. Refreshments will be available on the day. Call us on 01509 815490, use our Contact Us form or drop in to get your tickets. This entry was posted in News on 31st March 2016 by William Middleton.